If you’re looking for unique gift ideas to crochet for Valentine’s Day, look no further! 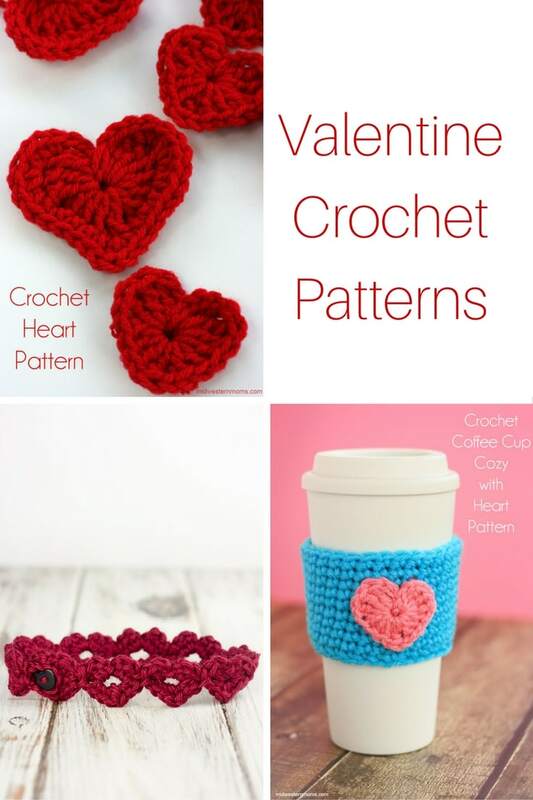 We’ve put together a list of free Valentine crochet patterns for you to enjoy! I find myself always looking for new gift ideas for my children’s teachers, female family members, and quick projects to make up for my friends and their children for the holidays. These heart-filled free crochet patterns will hopefully leave you inspired to make something new for Valentine’s Day. This pattern gives you measurements for a headband newborn-sized through adult. This would be a great accessory for a Valentine-themed photo shoot. What a great project for Valentine’s Day decor that you can keep and reuse each year! A quick and fun craft! A good gift idea for your coffee loving friends and family. This cozy fits a standard coffee tumbler. A cute crochet envelope to present gift cards or other small items. Add a heart for Valentine’s Day! These adorable heart slippers are crocheted using the graph technique and available in women’s sizing. What a wonderful gift idea! I love wearing cute, handmade boot cuffs with my tall boots. These have scalloped edges, and hearts! Very cute. This cowl design is amazing! I love the texture and the twist. I might have to make one of these for myself! Amigurumi bunny pattern with a heart on its ear. Great idea for kids of all ages. These baskets would add some color around the house and hold small trinkets or jewelry. Cute hat pattern in Valentine’s colors, with a heart. This would be a great newborn photo prop. Adorable gift bag that could hold candy or other Valentine’s Day gifts. The simple corner to corner crochet table runner pattern would be a cute addition to any Valentine’s Day decor. A collection of five different free crochet dishcloth patterns, all Valentine themed! Would be a great gift! Free crochet board game pattern for tic-tac-toe! A great gift idea for kids. Loving this infinity scarf containing tiny multi-colored hearts. Great winter gift for your best friend! One of my favorite hat patterns on the web! I’m going to have to make this one next. A great idea for the book lover in your life. This is the cutest crochet heart bookmark I’ve seen so far! Looking for a way to give roses that last forever? These realistic roses would make a gorgeous bouquet. Pillow crocheted with a heart, using the cross-stitch method. Would make a lovely decor accent piece. Which of these patterns are you excited to make first?